We understand a CHIP reverse mortgage is a big decision. We offer you free help from a licensed mortgage agent who is a Certified Reverse Mortgage professional from our highly trained team. Our goal is to help guide you along your journey to financial security and make sure you’re 100% satisfied and happy that the reverse mortgage decision you make is absolutely right for you. Our advice is impartial and objective – as a broker we do not work for any bank or lender. We are a Canadian company and we specialize in the Canadian Reverse Mortgage Market. Information is POWER! The best place to start is with our FREE Ultimate Reverse Mortgage Guide. Our guide outlines key information and facts you need to know about a reverse mortgage and the Canadian market. It addresses and takes on the Myths about reverse mortgages head on with honest answers – it is quite possibly the #1 most downloaded free Reverse Mortgage Guides in Canada – thousands of Canadians just like you have now received our free guidebook and use it to help navigate the reverse mortgage process. Our job is to coach you and ensure we are impeccable with our communication and education. 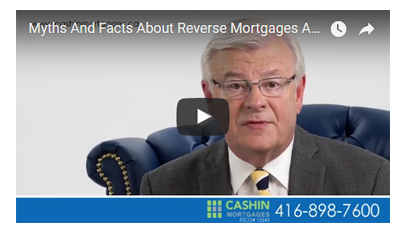 We have compiled Canada’s most extensive collection of informative reverse mortgage videos with well-known Canadian personalities to help explain how Canadian CHIP Reverse Mortgages really work. 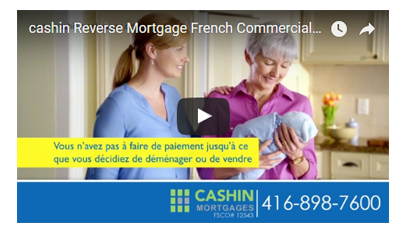 It’s quite possibly the #1 most downloaded and viewed reverse mortgage video library in Canada. Thousands of Canadians just like you have been educated and enlightened by our video library collection. Our team has spent 100’s of hours researching and learning reverse mortgages. 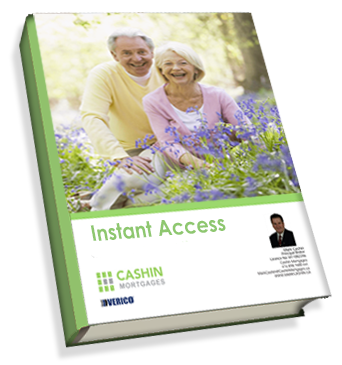 They have written, collected and have made available to you the most extensive CHIP reverse mortgage library in Canada. It is your ONE STOP location for everything “Reverse Mortgages” in Canada. Just click on this link for INSTANT access! It is simple and only takes seconds! Click this link and fill in the form to get a quick and easy assessment. This is your chance to cut right to the chase and see if you qualify for a Canadian CHIP Reverse Mortgage. It really is that simple. 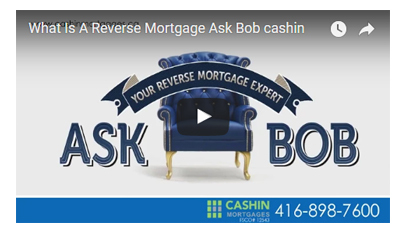 Cashin Mortgages is known as the ”GO-TO” for CHIP Reverse Mortgages because of our fast, friendly and no pressure approach to helping retired Canadians just like you. STEP 5: The Ultimate FREE CHIP Reverse Mortgage consultation. We Offer FREE Expert Advice To Help You! There is a lot of false, misleading and just down right incorrect information out there. We help bust the MYTHS surrounding reverse mortgages. When you get free professional help from one of our Certified CHIP Reverse Mortgage specialist, who is also a licensed mortgage agent, you are protected by the law. 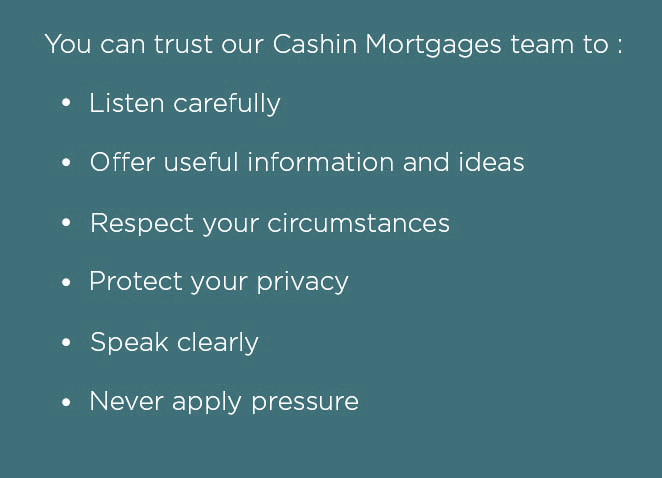 At Cashin Mortgages, we ensure you are protected and know the truth. We understand making an important financial decision like this for you and your family needs to be done right the first time! We want to ensure you are 100% informed and are 100% confident that it’s correct and that we have done our job of educating and coaching you through the process. We want to make sure you understand what you are signing up for and there are no surprises, small print or catches.That’s why having an independent and objective licensed mortgage professional who is certified in Reverse Mortgages a Specialist on your team is so important. We have guided hundreds of people in Canada through this decision – so you can benefit from our experience. Remember this consultation and service is absolutely FREE! You do not pay anything to our specialists. 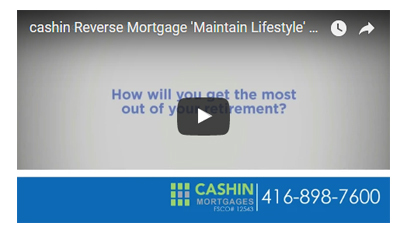 Here is a great video from fellow retired Canadians that have a CHIP Reverse Mortgage. See how it has helped them! Do not rush you into any decision. This is our best advice for all clients. We will provide you all the information you need to know – not just the reverse mortgage “PROS”, but we will layout the disadvantages as well, based on your unique situation. Every customer is different and their financial situation is unique so it is never a one solution fits all. All of this is contained in our free Reverse Mortgage Guide. We provide you with this free guide – as well as information packs, articles, calculations and everything you need – so that you know this is absolutely the right decision for you to do. No pressure at any time. Read through all our advice in your own time and do not rush into this decision lightly. Will I Always Own My Home? YES! One of the biggest misconceptions about a reverse mortgage is that you might lose your home. Let’s set the record straight…this is 100% false. You will always own your home. It is just like any other mortgage you would use to help improve your life. The only difference would be the features. A CHIP Reverse Mortgage is specifically designed with retired Canadians in mind to help keep you in your home longer and meet monthly obligations or help a family member. Quite simply a reverse mortgage is designed to give you access to your hard earned equity TAX FREE! We’ll help you weigh the reverse mortgage pros and cons. Yes, just like a regular mortgage you have to still pay your monthly obligations like property taxes, insurance and condo fees. You will always own your home as long as you keep up with these. However, you have the option of making monthly payments on your reverse mortgage if you choose. Find out what other reverse mortgage pros v. cons there may be – it’s as easy as clicking this link – in seconds you will be on the path to tax free income. Isn’t it worth a little bit of your time? Family members are our biggest influencers regarding our big life decisions and we find they are also the main source of false information surrounding CHIP Reverse Mortgages. With so much false information swirling around out there about this tax free financial strategy, family members can be confused, mislead and even down right frightened. That’s why we have created tools and guides to help include all family members in the discussion. Our Certified Reverse Mortgage Specialists have been trained to help with and facilitate open discussions with you and your family. We speak to any family members you like and will make sure that they too, are happy with your decision. Here is a great video to help start the discussion with your family. We understand that it’s important that everyone be well informed and develop a level of comfort with these big financial decisions. Our extensive library, work sheets and tools will help everyone involved learn how this tax free equity product can work to help make your life easier month to month or completely change your life while in retirement. 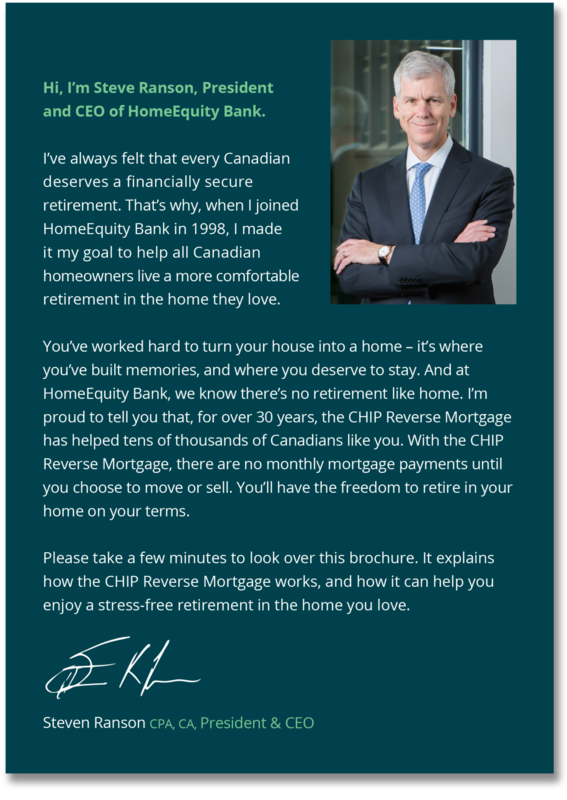 The CHIP Reverse Mortgage has been available in Canada for over 30 years and is recognized by many financial experts as one of the many tools to help Canadians enjoy their retirement. Now is the time to see if it can help you! We are fully licensed mortgage agents with Cashin Mortgages Inc. Financial – FSCO License #12543. Each customer’s situation is unique but the average time from start to finish is between 10 and 30 business days. You can find a document in our library which gives a detailed timeline. 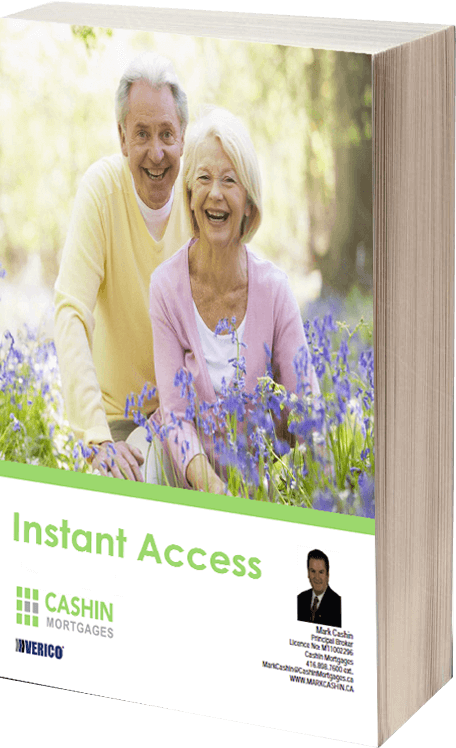 Once you request instant access to Canada’s most extensive CHIP Reverse Mortgage library you will have all the information and tools at your disposal. In addition, a “Certified Reverse Mortgage Specialist” will be in touch within 3 hours of you completing your assessment form. Our Service Guarantee ensures that you will receive fast, free help every step of the way. Let our Certified Reverse Mortgage Pros do all the hard work for you and unlike the banks, you do not have to visit us if you do not wish to. You can start the process right from the comfort of your own home. Remember WE WORK FOR YOU…not the banks! All Your Life You Worked Hard, Saved And Built Equity. Now it’s Time for Your Money to Work for You. 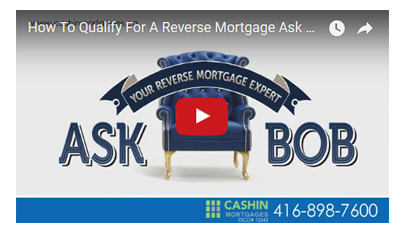 We have established that CHIP Reverse Mortgages in Canada can be confusing and to navigate all the misinformation can take time and lead to more confusion. We have done all the hard work by creating Canada’s most extensive CHIP Reverse Mortgage Library. Our team will do all the hard work to ensure you are comfortable with this financial decision. You have worked hard enough! It’s time to let our team of Reverse Mortgage Professionals handle this for you. And it is all FREE. We are authorized, trained and certified by HomEquity Bank Canada – the only provider of this product in Canada. You can get the full support and help of a licensed mortgage agent to guide you through the process and provide insightful answers to any questions you have along the way. A Certified Reverse Mortgage Professional to provide advice and guidance every step of the way. Trained and licensed professional advice so you can make sure that this is the right decision for your future. 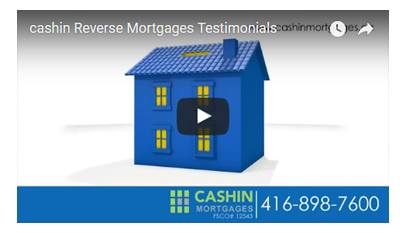 Award winning service from Cashin Mortgages and the Verico Canada Team. Help, guidance, coaching, information and guides will make this a smooth and rewarding process. It always pays to get professional help. Reduce your stress when you work with a Cashin Mortgages team member. Dozens of free articles and advice from our Cashin Mortgages Certified Reverse Mortgage Professionals and our site. Cashin Mortgages Inc. is a proud member of Verico Canada – the #1 Mortgage Brokerage in Canada. The biggest myths, including the real pros and cons of a reverse mortgage. A comparison of this product to a Home Equity Line Of Credit (HELOC). Frequently asked questions that you need to know before making your decision. We continue to strive to be #1 with our products and services. Our certified Specialist CHIP Reverse Mortgage can help you no matter where you live across Canada. We provide direct access to the only Canadian Reverse Mortgage product in Canada which is federally licensed by the Government of Canada. You are protected when you deal with Cashin Mortgages. Contact us with any questions you may have, literally 1000’s of retired Canadians just like you benefit from our CHIP Reverse Mortgage product EVERY DAY! Start today – get your FREE Guide! Would you like a package mailed to you? 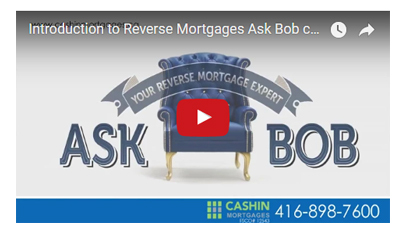 Here is a great video from fellow retired Canadians a CHIP Reverse Mortgage has Helped!